The bullet point was hardly ever used until Microsoft got its teeth into the issue and developed the automated listing system, with bullet points, letters of the alphabet and numbers. And talking of numbers, the move from single to double-digit numbers with left-hand justification, rather than right-hand justification, is a constant irritant. Numbered lists should be right-hand justified. a. Do they provide added value? b. Could the same list be made without bullet points? c.	Could the bullet points be replaced by letters of the alphabet or numbers? a. You have to count down the right number of bullet points without error. b. Your colleague has to do the same. Have I convinced you that letters would be better? I prefer letters to numbers because I get most annoyed when the numbers go beyond 9 and the Microsoft left-hand justification takes over. If I have convinced you, could I suggest one more step to make your report even more useful? You see it in action here. Every paragraph you write is numbered. So, instead of saying it’s the fourth bullet point in the second paragraph on page 6*, you simply say: Ref 1.7b. Then it is clear exactly where you are, and there’s no need to count, and possibly err in the process. *Although the system described above obviates the need for page numbering, it is always very wise to number your pages, again for easy reference, and double security, i.e. ref point 1.7c on page 1.
a. 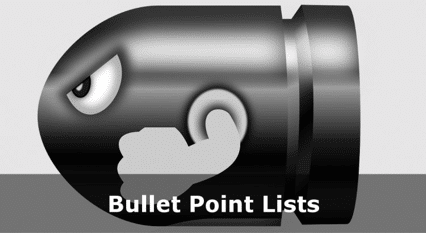 Think before you use bullet points – do they give added value? b. Use a numbering and lettering system for every paragraph of writing. c.	Always number your pages. What About a Bit of Praise? © The Kelvin Consultants Ltd. All Rights Reserved.